A major task in the History of Settlement project was to create a map of the parish and the village from information in a manorial survey carried out in 1586, probably at the behest of Brian Stapleton, the Lord of the Manor. While there may originally have been a map with the survey documents it has not survived. For details of how this was done go to Bingham in 1586. The Manor of Bingham coincided with the whole parish, but in 1586 about 15% of it was owned by freeholders, the most prominent of whom were members of the Porter family. Brian Stapleton owned the rest. Brian Stapleton was the last of his family to be Lord of the Manor of Bingham. The tenureship of the family overlaps with the Tudor period, which began in1485, when Henry VII acceded to the throne. The Stapletons owned Bingham from c1460-70 to c1590. The evidence for the changes he brought about comes from an analysis of the distribution of medieval and early post medieval pottery. From the work done to create the 1586 map we know that at that time the manor consisted of four arable open fields, demesne land and areas of common grazing, including Ox Pasture in the far south west of the parish. When the medieval ceramic types are plotted onto that map (see Figure 3.28, for example) they show high concentrations of pottery in furlongs that were pasture or common grazing, in particular, Ox Pasture, which includes Lower Brackendale Farm site, a place with a long history of settlement. The first ceramic type that does plot well on the 1586 map and shows no ceramics on Ox Pasture is Cistercian Ware (Figure 3.33). This was made in Ticknall from the late 15th century. It is reasonable to assume from this that the centrally controlled land management system evident in 1586 was probably implemented more than a century earlier in the late 15th century before Cistercian ware became commonly used in Bingham. It could well have been introduced by Brian Stapleton, the new Lord of the Manor. In order to do this he would have had to encourage by fair means of foul the remaining occupants of the farms that existed around the margins of the parish to move into Bingham village, thereby finishing off a process of change that had started with the Black Death. It is also evident from the Cistercian Ware map that there is an unusually high concentration of sherds in West Moor, which in 1586 was common grazing. Moor Lane and a northward extension that still exists as a farm track and public path would have accessed this area from Market Place. This area has exceptionally high concentrations of most types of pottery from the 16th century onwards and it is thought to have been the site for the village dump, remaining as such until near the end of the 19th century. It seems that the Stapletons not only reorganised the way the land around Bingham was farmed, they tried to clean up the village as well. Thus, from the beginning of the Tudor period Bingham was more or less as it was in 1586. At this time Bingham was a small market town, which acted as the capital of the villages within the Nottinghamshire portion of the Vale of Belvoir, an area known for producing an abundance of corn. Apart from its weekly market it was the centre for the Hundred (or wapentake) of Bingham, one of the administrative subdivisions of the county, and of the Bingham Deanery. The size of its population is not known but was possibly around 400, equal to the largest villages in the area such as Cotgrave and Radcliffe. It almost certainly contained several tradesmen and craftsmen who served the local hinterland, but it was essentially a large agricultural village with a market probably dealing mainly in butter, cheese and garden produce rather than corn or livestock, which are likely to have been traded in more important markets such as Nottingham, Newark and Grantham. The map of the village shows well-spaced houses or cottages each set within their own piece of land. The streets follow the gridiron pattern typical of the planned medieval village and had probably been little changed since the 12th century. An examination of the status of the occupants of the properties shows that most of the farmers lived along Husband Street, while the cottagers tended to live along the northern back street shown as Chappell Gate, Old Market Place, Church Gate and Goodwyn Lane on the village map. No habitations are shown along the southern back street, now The Banks. This was probably used mainly for access to the arable open fields that lay immediately to the south of it. Neither were there any habitations on the lanes that linked the streets. The village had a church and rectory, a windmill, a bake house, a manor house that was said to be unoccupied and in a tumbledown condition, and there were dovecotes, stables and barns attached to some properties. There is only one mention of the word house in the document and it is thought to have been a public house. While only one mill can be sited on the village map, there is reference in the furlong name to at least two others outside the village. The conjectural map of the whole parish shows the extent of the open arable fields, the common grazing land and the demesne lands. There were four open fields, each divided into furlongs (A furlong is an area of land made up of strips, each of which is individually farmed. Furlongs have no standard size or shape). Each furlong is made up of strips, which were the basic unit farmed by the tenants. A strip is thought to be the amount of land that could be ploughed in a day. The names of the furlongs indicate the varied usage of the land in addition to the main use of growing cash crops. Two furlongs called Coneygarth were almost certainly rabbit warrens. Sawsey is a wet area where willow was grown for basket making. Nether Woodgate in West Field (no Upper Woodgate is mentioned) is in the right position to mark the position of a track into the wood-pasture that is thought to have existed before the 13th century. There are three furlongs called Upper or Nether Claypit in North Field . These may have been used to extract clay for bricks or for marling. Interestingly, nowhere in the documentation is there a reference to fishponds. Explanations for other furlong names can be found in the section The Open Fields. Throughout the parish the land seemed to be used for arable, pasture and meadow in the ratio 70:10:20. Even within the arable open fields there are places where individual strips are themselves divided longitudinally between arable and pasture or meadow. This is most marked in East Field, where only 78% is arable. Generally, there are strips worked by all the tenants in the village in each of the large furlongs and tenants could have strips in nearly all the furlongs in the parish. Agnes Musson, who rented 61 acres is one such. There is no indication that much of the parish was left as wasteland; nor is there any information about what crops were grown in the open fields. There is reference to two orchards and it is presumed that the cottagers grew a wide range of horticultural produce in their gardens as well as keeping hens and pigs. The names of all the tenants are given in the documents and the size of their holdings has been calculated. There are 25 with more than 20 aces. The largest is 98 acres farmed by John Ludlam. Most of the freeholders are not mentioned, but it is likely that Robert Porter, the largest landowner among them, owned more that 100 acres. Twenty seven cottagers are listed. They tended to have less than 2 acres, but there is little information about the trades and skills of these smallholders, who must have been the farm labourers, blacksmiths, carters, coopers, wheelwrights and others providing skills and labour to keep the agricultural economy going. Only a shoemaker is specifically mentioned. Most of the cottagers did not have strips in the arable open fields and it is presumed that they provided some of the labour to work the demesne land as well as the holdings of the freeholders. Though there was no resident Lord of the Manor, there were some wealthy tenant farmers as well as the Porter family of freeholders. The finds collected during field walking reflect this. While the poor people would rely on wood and leather for domestic containers, common kitchen and dairy ware for the period was Midland Purple ware, which was widely used in the 15th and 16th centuries. Sherds have been collected from straight-sided and curved jars, cisterns, shallow bowls, pancheons, butter pots and jugs. The better off would have used pewter for tableware, but at the beginning of the period Cistercian ware appeared. 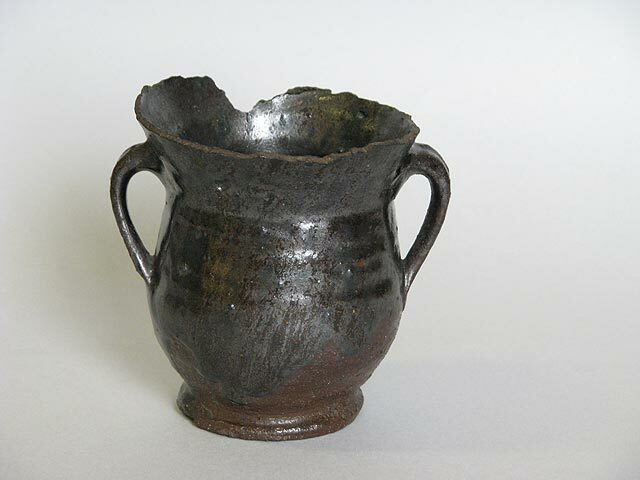 This lustrous, black or brown-glazed fine ware, made in Ticknall in south Derbyshire, appeared in a wide range of forms, including mugs, cups, tygs (cups with two or more handles), costrels, bottles, jugs and chafing dishes. The vessels were often decorated with a religious motif, but this stopped at the Dissolution. Cistercian ware was unlike any earlier pottery in having a near complete glaze both inside and outside the vessel. In Elizabethan times it evolved into better quality Midland Black Ware. 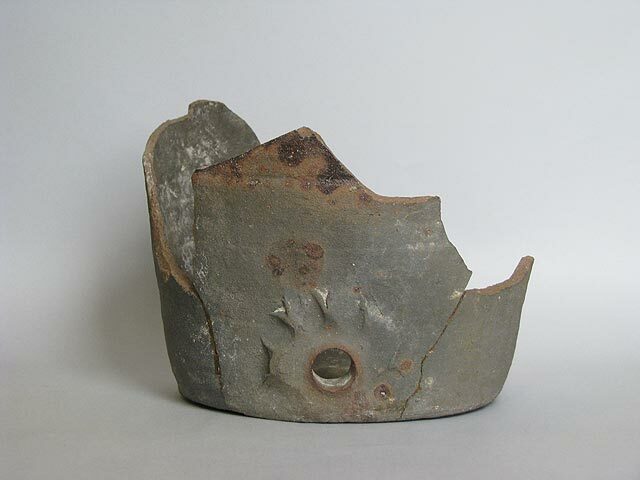 A small number of fragments of Bellarmine jugs, (embed Bartmann thumbnail here. Caption is Bellarmine Jug. Long caption in the Captions file.) imported from Germany in the late 16th century were collected during field walking. These salt-glaze stoneware vessels were made around Cologne and exported containing a white spirit, possibly like modern day schnapps. Because the jugs were so durable they were used in the Vale of Belvoir as witching vessels and some have been found built into the walls of Tudor cottages. They would have been filled with urine, hair, nails and other things thought to have the power to ward off the evil spells of witches. 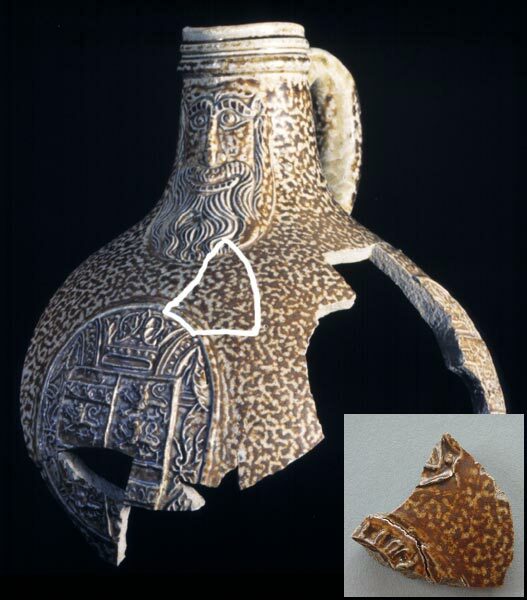 This Bellarmine jug was found in Jamestown Virginia. The piece found in fields in Bingham fits it and is thought to have been made at the same time, which is in the 1590s. One of the striking things that has emerged from a study of newspaper articles about Bingham in the 18th and 19th centuries is the enthusiasm with which the community celebrated national events. It seems that there is a long history to this. 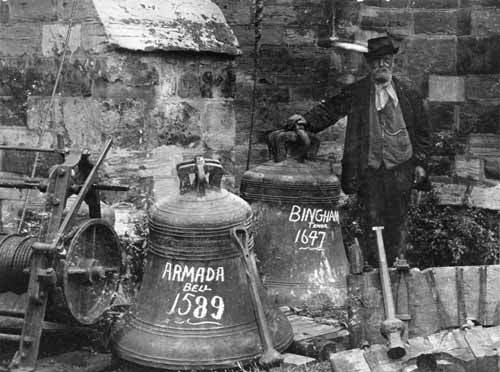 To celebrate the victory over the Spanish by sinking the Armada in 1588 Bingham acquired a new bell for the church, the so-called Armada Bell, dated 1589. One can imagine the party that took place in Market Square the day that was rung for the first time. A rare chance to see the Armada bell when the bells were taken down for renovation to the tower. It was made in 1589 for St Mary’s and All Saints church in celebration of victory over the Spanish Armada. There are other less welcome national events that must have afflicted Bingham at this time. There was a national outbreak of “sweating sickness” possibly influenza in 1558 and outbreaks of plague in 1564, c1592 and c1605. There were also two great famines, one in the mid 1550s and the other in the 1590s. It is unlikely that Bingham escaped any of these.